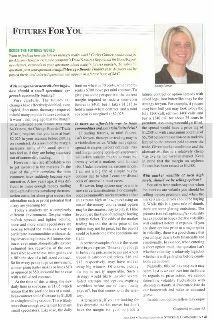 You may recognize Carley Garner from her monthly column "Futures for You" featured in Technical Analysis of Stocks and Commodities. TASC is a popular and widely distrubuted trading magazine read by industry insiders and retail traders alike. Along with Carley's column, the magazine is extremely competitive in terms of content and we highly recommending adding this publication to your mix or research tools. This is a great tool for those who want to learn to trade commodities. Pick up your copy today, or subscribe!